You want to work out, but when the gym is so packed that every machine and bench are taken you need all the self-control to not say, "Screw it!" and kick something on your way out. Don't worry: You might not get the workout you planned for, but with a little ingenuity, you can still get a good one. Illustration by Sam Woolley. Images by combust and campdarby. 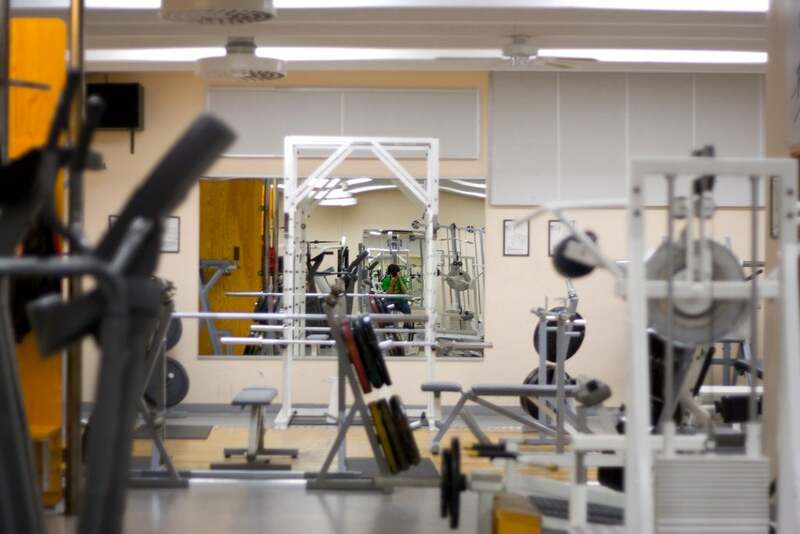 There's no helping the seasonal spikes in gym memberships, or the number of people in the gym at all, but day to day, the busiest gym hours tend to be when people go to and leave work. Expect crowds between 6:30am and 9:00am, with a lull between 10:30am and 3:30pm, before the evening crowd bustles in to lay claim to every squat rack, treadmill and stretching space. Then it tapers off again at 9:00pm. These peak hours are fairly consistent across the many gyms I've been to around the world, but if you're ever in doubt, just ask the people at the front desk. Or, check Google. It knows everything. You probably have a specific workout you want to do in mind, but your chances of following it exactly may seem bleak when everywhere you look there's a sweaty person using exactly the same equipment you need to use. If you really wanted to, you could wait for things to open up or just ask to work in with other people while they rest; but why not use this as an opportunity to learn about so many other different variations of exercises? For every favourite exercise, like a squat or push-up, there are plenty of alternatives and variations, too, some of which you don't even need the squat rack for. It helps to come prepared with those alternatives in mind. Ideally, these substitutions should be similar in function to the exercise you need to replace. Let's say you came to deadlift, but damn, not a free barbell in sight. That's OK, hip thrusts, cable pull-throughs, heavy kettlebell swings, hyperextensions, or suitcase deadlifts with a dumbbell or kettlebell are all great alternatives, because they all follow a similar movement pattern and work similar muscle groups. This is where databases like MuscleWiki or ExRx.net come in handy, especially if you don't know what exercise to replace with your tried and true favourite. The MuscleWiki mobile app (free for iOS and Android) makes finding replacements or alternatives to your favourite exercises really convenient when you're at the gym. During busy times, weight benches are a highly prized commodity. So if you were planning to do chest exercises or something similar, you probably think you have to give up on them without a bench. But the bench is just a stable surface (though elevated) for you to lean against. When a bench isn't available, the next best thing is the floor itself. You can still do some chest exercises off the floor. Obviously, push-ups are one option, but the lesser known dumbbell floor presses are another. It's the same as pressing dumbbells from a bench, but, you know, from the floor instead. By being on the floor, however, you need to use more chest strength to lift the weight because you can't use your legs to push. Get yourself some floor space and you could also work on the crow pose, Turkish get-ups, glute bridges, dead bugs, bird dogs and countless other bodyweight exercises. If you're trying to do a strength training workout, one of my favourite fallback plans involves strategically pairing exercises together. Supersetting is one way to do this, where you pair two exercises that work opposing muscle groups and do them back to back as a single "superset". For example, you can pair push-ups (chest) with rows (back.) Plus, when people are waiting, supersets help you blast through the exercises quickly. In a really busy gym, I'd suggest making sure at least one of your two exercises is a body weight variation. This way you don't hog up several machines, or need to wait for anything to open up before you can continue your workout. In fact, the video above shows that you can do supersets with bodyweight exercises alone. Circuit training follows a similar idea to supersets, except you string together six to ten different exercises and go through them all consecutively to complete one circuit. Circuits are perfect when the gym is packed because you don't need much space to get a full workout. You can throw in any exercises you want, but the idea is to work out your whole body so a variety would be ideal. The video above by Nathen Mixon is a beginner-friendly, body weight circuit routine, while the video below by Bodybuilding.com involves weights and is more advanced. 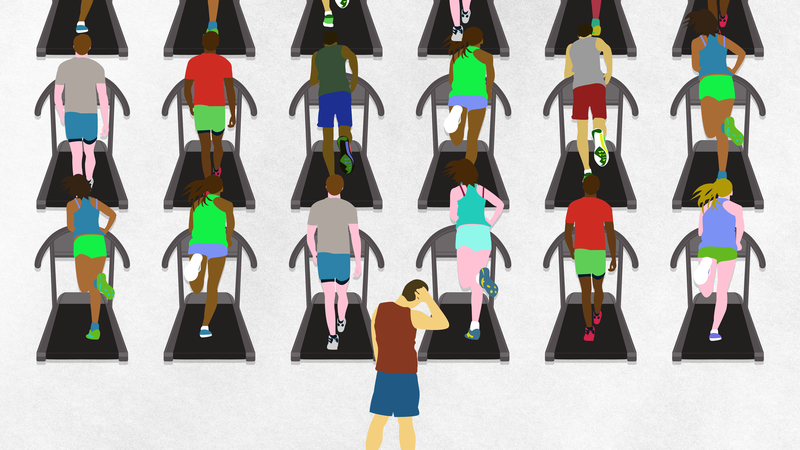 Everyone goes for the treadmills or ellipticals. Very few people gun for rowing machines, but that's good news for you. Rowing is actually an intense, full-body cardio workout. (Shhh...don't tell anyone else!) Rowing follows a very precise rhythm and form, though, so check our previous article to learn those finer points. Be sure to practice good form, and start slow if you're unfamiliar. Don't underestimate rowing, though. Even 10 minutes on the machine can get fit people winded. If you want a challenge, you can do any number of interval-style workouts on the rowing machine we mentioned, or a workout like the one from the video above. OK, if the dumbbells, squat racks, and machines are somehow all taken, it's still not a big deal. Scout the gym floor for other equipment like kettlebells, battle ropes, and suspension trainers. You might not have paid much attention to them before, but if they're around you'll instantly have access to a new world of novel, challenging workouts. In fact, we've covered what you could do with kettlebells, the powerful workouts you can do with battle ropes, and all the different exercises that a suspension trainer makes possible. Some workout ideas: if you only use a kettlebell, you can do kettlebell swings for 100 reps, broken down into 10 reps at a time, and be pretty toast after that. For battle ropes, follow along with the above video by Adrian Bryant; it's perfect for beginners. And finally, my article here dives into both an upper body and lower body suspension trainer workout that I followed for months and saw great strength-building results following. The most important thing, and the bottom line here, is to be flexible and adapt to your situation. You won't always have the weights you need or the right equipment available for your one true workout, so you have to make the the best of what you got. Doing something is so much better than telling yourself that just because conditions aren't perfect you need to hit the reset button. Here's a hint: conditions are almost never perfect. Those are the times when it's easiest to fall off the wagon and never go back to the gym. I get out of work at 3:30 p.m., have about an hour commute home, then go directly to the gym from the train. My strength training routine takes about 45 minutes, and I do it 2–4 times a week. I try to do active things on the weekends (long bicycle rides/walks/hikes) and do that for 3+ hours. Just reinforcing what was said, don't do supersets with two bits of equipment in a packed gym! When it's busy you're meant to share equipment not hog two things for yourself! If your gym is packed. Use your workout time to find a less oversubscribed gym.